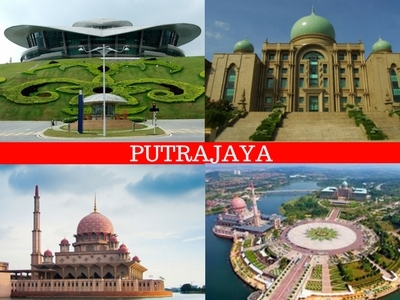 Officially the Federal Territory of Putrajaya, is a planned city and the federal administrative centre of Malaysia. The seat of government was shifted in 1999 from Kuala Lumpur to Putrajaya because of overcrowding and congestion in the former. Kuala Lumpur remains Malaysia's national capital and is the seat of the King, the Parliament, and all the foreign embassies, and the country's commercial and financial centre. Putrajaya was the idea of former Prime Minister Mahathir Mohamad. It became Malaysia's third Federal Territory, after Kuala Lumpur and Labuan, in 2001. Putra Mosque - The Putra Mosque is the principal mosque of Putrajaya, Malaysia. Construction of the mosque began in 1997 and was completed two years later. Putrajaya Wetlands Park - Putrajaya Wetlands Park in Putrajaya, Malaysia is believed to be the largest constructed freshwater wetlands in the tropics. It is the first man-made wetland in Malaysia, which includes a Wetland Park and the wetland areas. Perdana Putra - The Perdana Putra is a building in Putrajaya, Malaysia which houses the office complex of the Prime Minister of Malaysia. Located on the main hill in Putrajaya, it has become synonymous with the executive branch of the Malaysian federal government. Millennium Monument - Millennium Monument is a national monument in Putrajaya, Malaysia which is analogous to the Washington Monument in Washington DC, United States. It was the second national monument to be built in Putrajaya after Putrajaya Landmark. Putrajaya Bridge - Putrajaya Bridge is the link between the Government Precinct and the Mixed Development Precinct, also linking the Boulevard and Putra Square. It's the most important bridge in Malaysia and it spans across 435 meters. It's also a unique icon landmark of Putrajaya. The architecture and design was inspired by Khaji Bridge, a famous bridge in Iran. Putrajaya Lake - The Putrajaya Lake is a lake located at the centre of Putrajaya, Malaysia. This 650 hectares man-made lake is designed to act as a natural cooling system for the city and also for recreation, fishing, water sports and water transport. Putrajaya Botanical Garden - Tropical Botanical Garden is a good place to go during the morning or evening for a time of recreation. The tropics near the equator that stretches from Asia Pacific to Africa and South America received plenty of sunshine and rain throughout the year. As such, the diversity of the flora and fauna in these region still remains to be explored. © Copyright 2016, Global Academic Excellence.